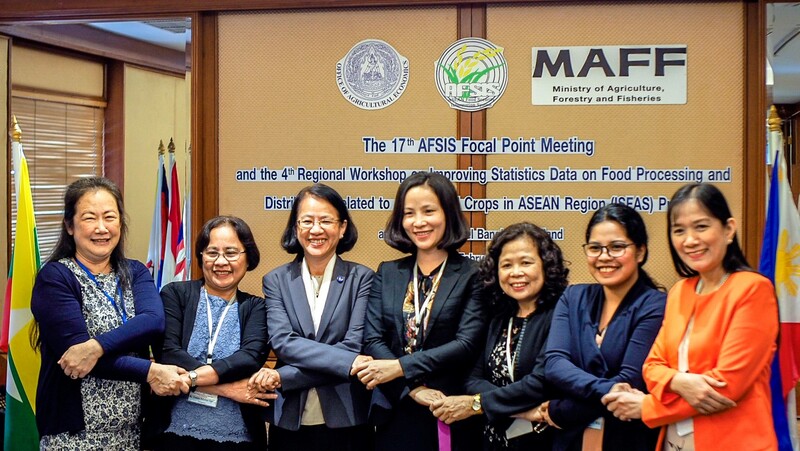 On the 21- 22 of February 2019, ASEAN Plus Three Food Security Information System (AFSIS) organized the 16th AFSIS Focal Point Meeting back to back with the 4th Regional Workshop on Improving Statistics Data on Food Processing and Distribution Related to Agricultural Crops in ASEAN Region (ISFAS) project at the Sukosol Hotel in Bangkok, Thailand. The Opening Statement was delivered by Ms. Jariya Sutthichaiya, The Secretary-General, Office of Agricultural Economics (OAE), Ministry of agriculture and cooperatives. The main objectives of the AFSIS Focal Point Meeting are to inform the ASEAN Plus Three members the overall outcomes and achievements of AFSIS in 2018 and to discuss on future work plan and issues. Whilst the 4th Regional Workshop on the ISFAS project aims to inform the overview and result of the third year implementation in three pilot survey countries namely, Philippines, Myanmar and Thailand as well as to consider the next year work plan.